The weather is heating up, summer is almost here, and I’m missing the Mediterranean fiercely. On today’s Culinary Staycation we travel to the Campania region of Italy, a place where Neapolitan cuisine reigns supreme. This area of Southern Italy is known for its farm fresh produce, much of it growing at the foot of Mount Vesuvius in fertile volcanic soils. The vegetables are so full of natural flavor that they don’t need much dressing up. Locals are spoiled by perfect lemons, aromatic herbs, and fresh vine-ripened tomatoes so sweet they could almost be dessert. Simplicity is key; fresh, quality ingredients take center stage in mouthwatering garden-inspired creations. Just off the Amalfi coastline, the sun-drenched island of Capri awaits… a place of rugged natural beauty brimming with culinary delights. 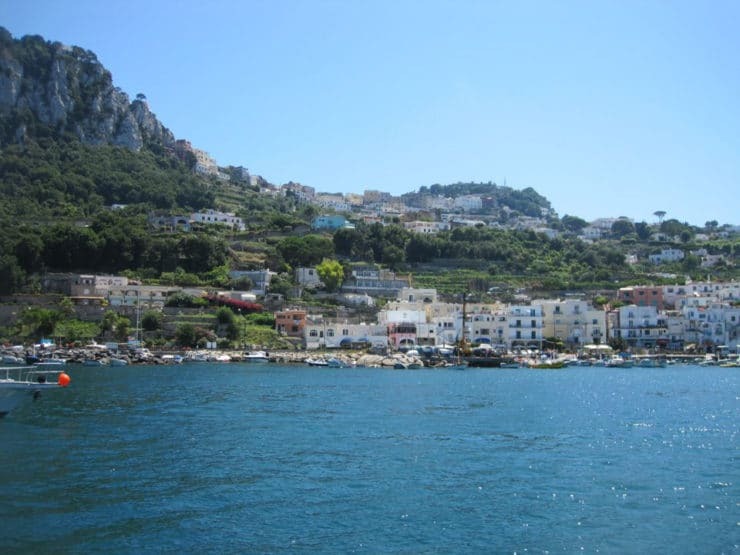 I had the pleasure of visiting Capri three years ago, the summer before I started my blog. My husband and I took a culinary vacation through Italy, Tuscany, and the south of France. Words can’t begin to describe this amazing experience. I blogged about the trip once before, when I shared my recipe for Ligurian Pasta Trenette. But I’ve never talked about our experience on Capri. It’s still fresh in my mind… the colors, the heat, the friendly locals, and sapphire colored water everywhere. 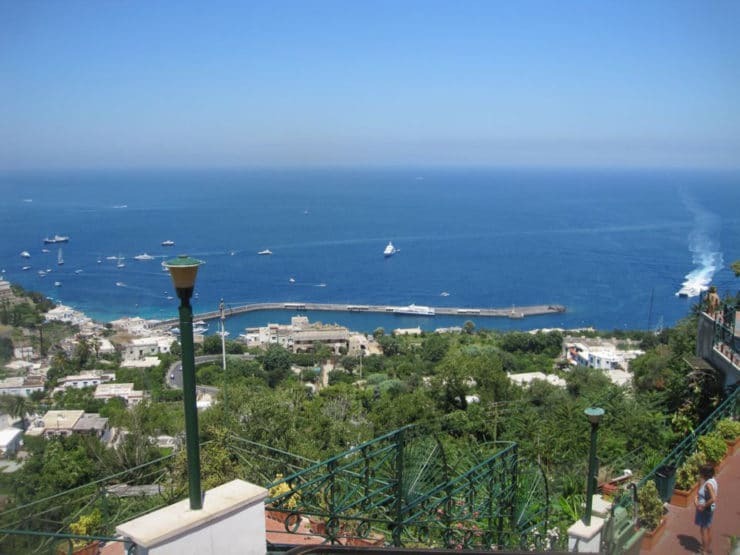 People have recognized the allure of Capri for centuries. Homer named it Antheomoessa, “the land of blossom.” The Romans called it Insula Sirenussae, “the island of the sirens.” Emperor Tiberius called it Apragopolis, a land of “sweet, carefree idleness.” A vacation haven for Italians and tourists alike, life on Capri revolves around simple pleasures… dining, drinking, and relaxing. Sun-drenched beaches and a jewel-toned blue grotto keep visitors entertained during the day. By night, the restaurants take center stage. Diners are wooed by handmade cheese raviolis topped with fresh tomato sauce (ravioli capresi), fresh seafood, and sweet lemon liqueurs. You have probably tried a dish inspired by Capri, without even knowing it. 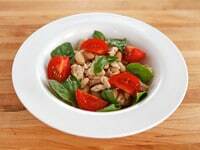 Insalata Caprese– that simple and ever popular salad with tomatoes, basil and mozzarella– translates to “salad in the style of Capri.” It’s a perfect example of the simple, natural cuisine that the Campania region is famous for. 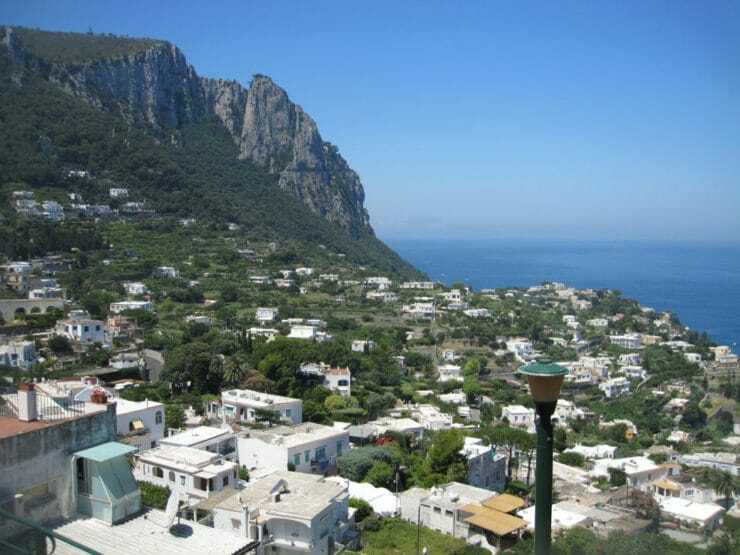 When we first arrived on Capri it was a hot, humid day. A small taxi whisked us up a winding road to the top of the island. We were hungry, but we were also hot. The humidity had drained us, and we didn’t feel like a very heavy lunch. I saw something on the menu that sounded light and fresh– Tuna Salad Caprese. I ordered it, and when the waiter brought it to our table I took a picture. Yes, I liked to take pictures my food even before I was a food blogger. Go figure. The bright red tomatoes were dripping with sweet juices. The tuna was tender and perfectly salted. The basil smelled like it had just been picked from the plant. I don’t know if it was the island, or the ambiance, or the fact that I was really hungry, but this was one of the best salads I’d ever tasted. How could anything taste bad with a view like that? Since our trip I’ve recreated this dish several times in my own kitchen. I love how easy it is– just six simple ingredients, and it only takes a couple of minutes to prepare. In summer, when the tomatoes are ripe and fresh basil is widely available, this is one of my favorite lunches. It’s a healthy protein boost that will keep you going through the afternoon. I’ve even eaten it for dinner when the weather is hot– it’s the perfect meal for those sticky days when all you want is a light meal. Every time I eat it I’m transported back to Capri, where the views are endless and the ocean is a perfect shade of blue. 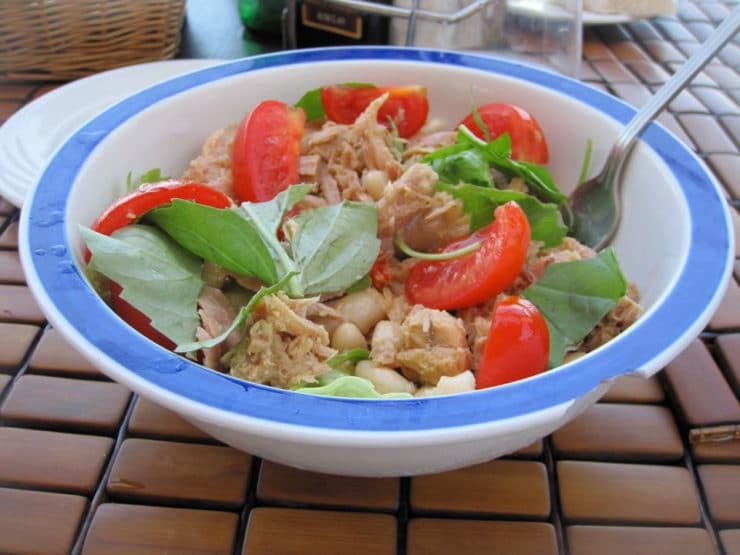 A tuna salad inspired by the island of Capri in the Campania region of South Italy. 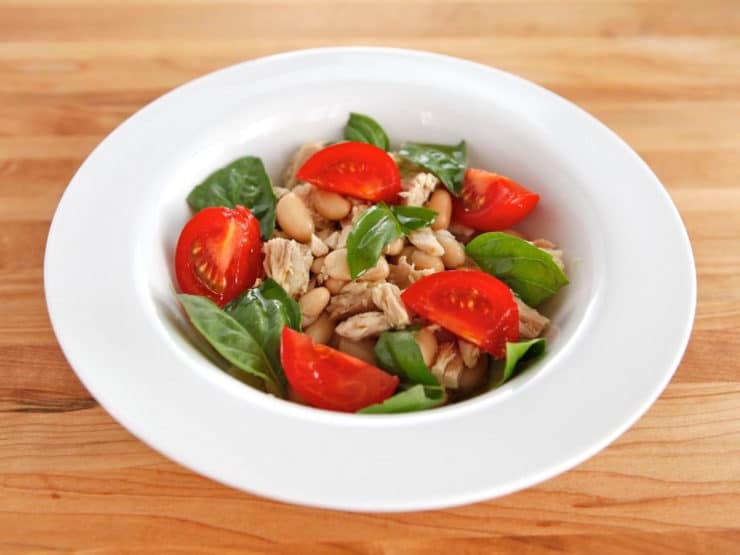 Tuna, fresh basil, tomatoes, cannelini beans, olive oil. Use the freshest ingredients possible. The simplicity of this dish relies on ripe, quality ingredients to give it flavor. Buy your tomatoes and basil from the farmer's market or harvest it from your garden. The tomatoes are particularly important- they need to be ripe and perfectly sweet. If you have a Trader Joe's nearby, the high lycopene tomatoes have terrific flavor. Use a good quality olive oil if possible. Drain the excess oil off the tuna and flake it into a salad bowl. 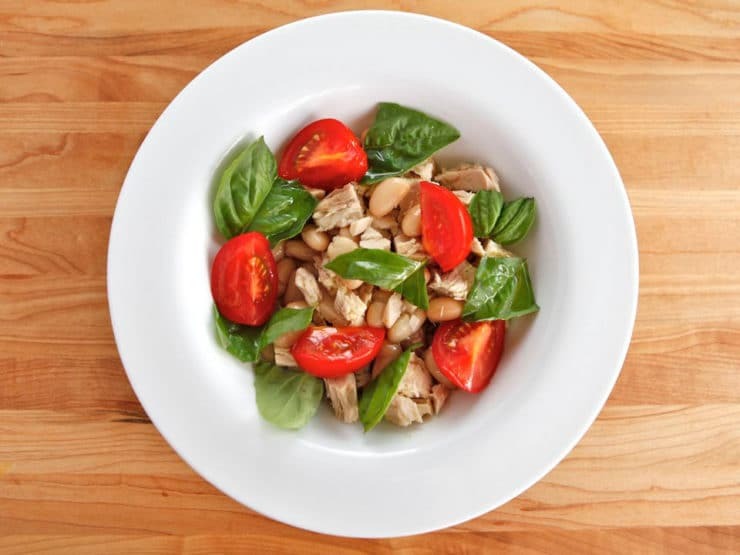 Scatter the beans, fresh basil and tomato over the top of the tuna. 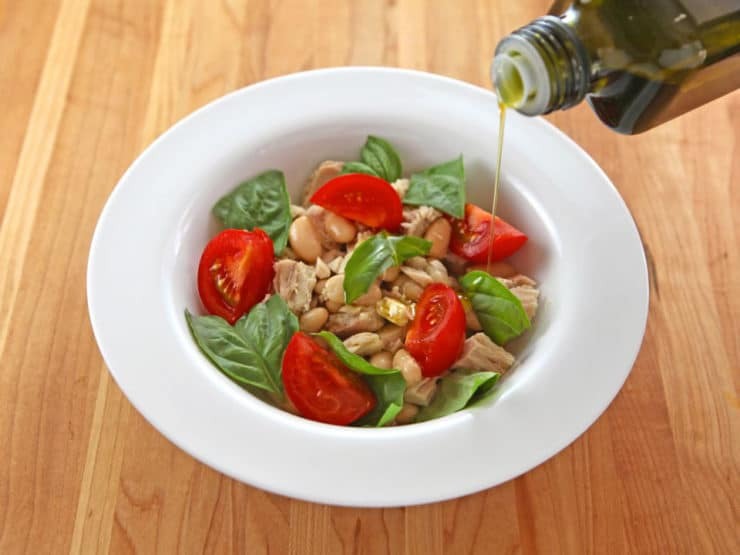 Drizzle the salad with olive oil and season with salt to taste. Serve. I just went to the Amalfi coast this past summer, we went on a boat excursion along the coast and stopped in Positano for lunch and this is the salad I ordered at an outdoor restaurant overlooking the water. It was delicious, especially with a glass of white wine. All the meals we had in Sorrento, Positano and Amalfi were fresh and delicious. love the simplicity of this salad, it looks delicious! Tory, your salad here looks more attractive, better presentation than the original in Capri. I enjoy reading your blog. You are great !!! Yummy salad! Fresh, easy to make and healthy! What a great combination of things that we already have in the house! I bet the basil could be subbed out for parsley or mint, too. Your recipes are always detailed and user friendly. Love your facebook page. Trying to eat raw for health and nutrition. Looks delish – my next lunch for sure! Curious – why use tuna packed in oil? Does it add something extra to this dish, or is it a preference thing? Hi Olivia! I prefer the tuna packed in oil, it’s more moist– the salad I ate in Capri tasted like it was oil-packed. Italian tuna often comes in jars packed with olive oil– this is my favorite kind of tuna. You can use water-packed too (I sometimes do), you’ll just need to add more olive oil for moisture and flavor. Enjoy!